Of high durability and dependability, the hook is perfect for hanging towel or clothes in bathroom, bedroom, kitchen, garage, utility room, laundry room, storage room, porch, foyers, hallways, entryway, etc. The mounting hardware package includes screws, anchor bolts, screw caps and washer. WEBI is a company specialized in research, development, manufacture, and marketing of architectural hardware for almost 10 years. Supplying not only hardware of high quality, but also professional technicial customer services, Webi has achieved a good reputation in construction industry. So do not hesitate to buy, and do not hesitate to contact our customer service if any problem. Webi will back you up. 1. Dimenssions: 1.6" length x 1.3" width.Deep:2 Inches. Please kindly take these product dimenssions as the standard. 2. 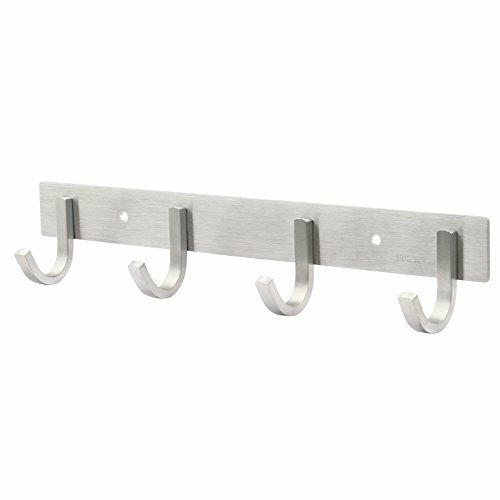 ANTI-CORROSION - Built in stainless steel 304 in brushed finish, the coat hook is durable in corrosion resistance. But please do not use it somewhere salty or extreme humid, such as beside swimming pool or sea. 3. To hold your clothes or towels in bathroom, bedroom, kitchen, utility room, laundry room, garage, foyer, hallway, porch, etc. 4. Mounting hardware included, easy installation. Screw-in hook to ensure sturdiness. If you have any questions about this product by WEBI, contact us by completing and submitting the form below. If you are looking for a specif part number, please include it with your message.